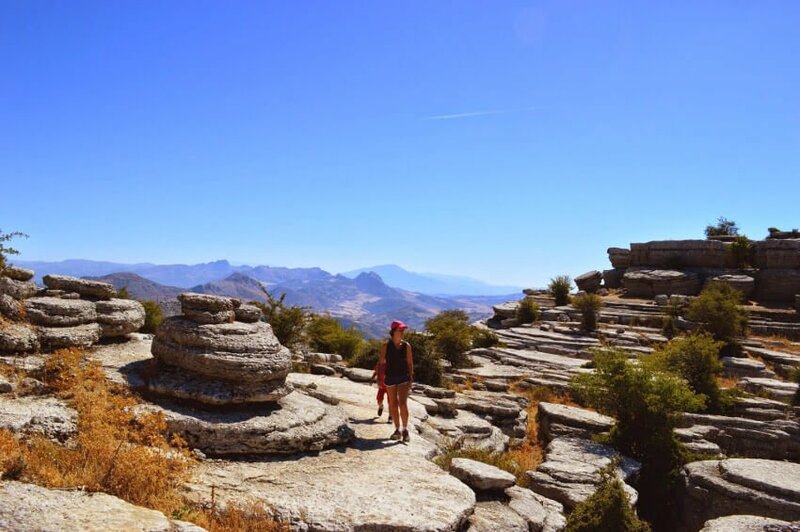 Most geologically stunning of all of Andalucía’s natural parks, El Torcal de Antequera Natural Park Reserve has a surreal, almost eerie feel to it. Known for its unique limestone formations, the whole area was under the Tethys Sea some 150 million years ago. Violent Earth crust movements forced the seabed upwards into hills and mountains, a couple of which are just over 1,300m (the highest being the Camorro de Siete Mesas at 1,336m). This was followed by millions of years of wind and rain erosion that has produced some of the most spectacular limestone scenery found anywhere in Europe. 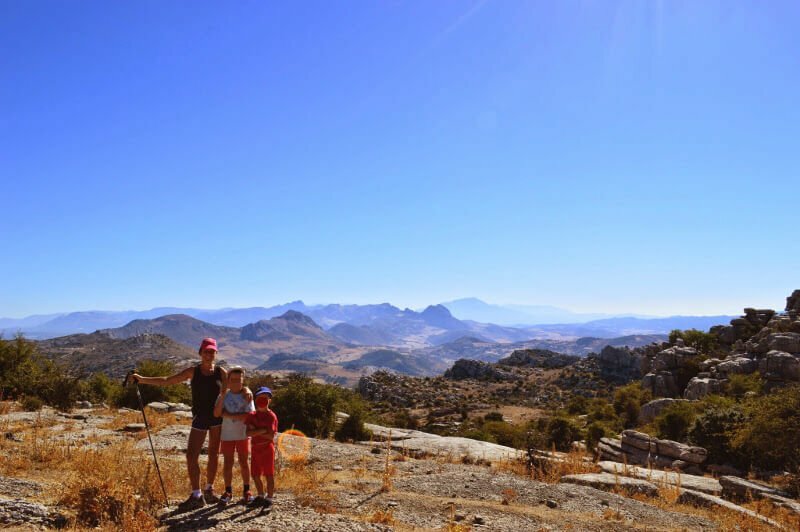 Amazingly, this unique landscape is only an hour’s drive from Málaga (approximately 45km north of Málaga and only 13km south of Antequera). There are many hiking routes, including organised ones – and visiting it makes for a fantastic day out for the whole family. 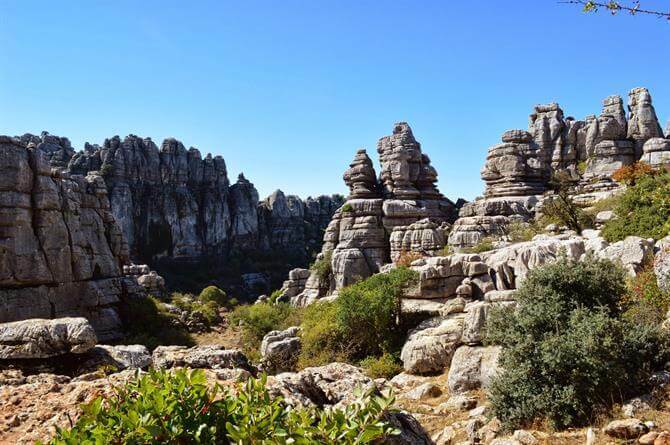 In 1989, the Junta de Andalucía finally acquired control of the land and the Torcal was reclassified as a Natural Park Reserve. It’s easy to see why it was so sought after: it has some of the most striking karst formations in Europe – that is, a landscape formed from the dissolution of soluble rocks such as limestone. 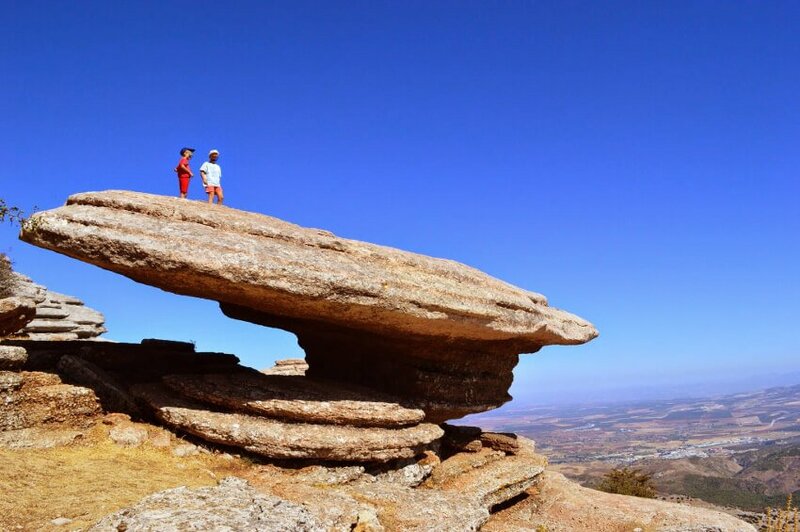 The stone making up the Torcal belongs to a series of marine sedimentary rock that dates from the Mesozoic age. During this “Middle Life” Era, life rapidly diversified. Spanning from about 252 million years ago to a mere 66 million years ago, this period was also known as the age of the dinosaurs. Being higher up, the Torcal has a unique microclimate with a lot more rainfall than surrounding areas. Due to it being particularly porous and soluble, the carbonate-rich limestone rock dissolves fairly easily, thus creating the fascinating natural sculptures that dominate the terrain. Because of the porous nature of the limestone rock, it also makes the region a “perfect reservoir” with underground rivers and a high water table. 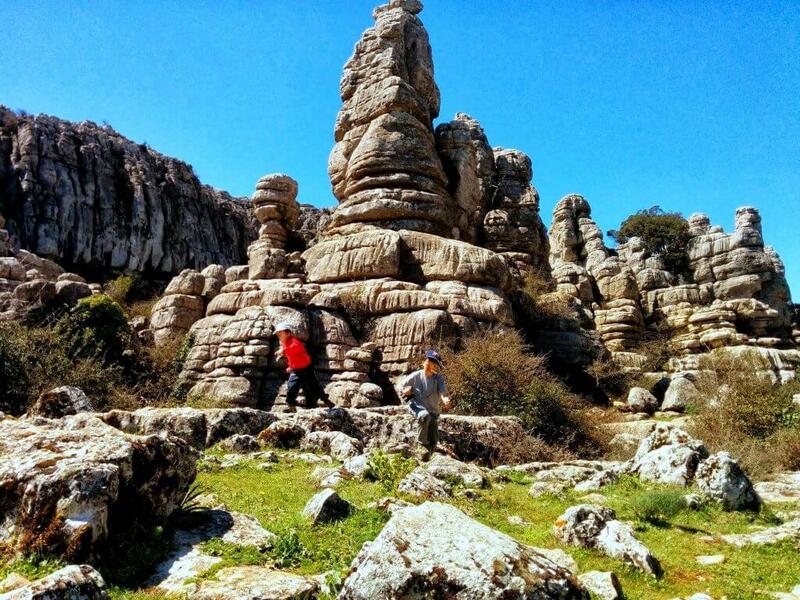 The source of one of Antequera’s most important rivers, Río La Villa, is just at the base of the Sierra del Torcal. People have been inhabiting the area since around 5500 BC. From the Neanderthals up to the Homo sapiens. The earliest evidence of human occupation is to be found in and around the Cueva del Toro. Various cave paintings and human remains have been discovered, all pointing to a fairly permanent settlement during the Chalcolithic period – the period roughly from 3500 to 1700 BC. This particular part of the Megalithic age is of specific importance to Antequera, coinciding with the building of the ancient burial sites known collectively as the Antequera Dolmens Site, made up of three amazing Megalithic monuments, and declared a UNESCO World Heritage Site. The Romans also left their mark by constructing many of the roads that lead to the mountain range. Some remains of these are still visible around the Boca del Asno and the Puerto de las Escanuelas. The Boca del Asno pass also played a particularly important part in later history during the battles between the Moors and Christians. It is said that a bloody battle in the 1400s led to the loss of 15,000 Moors but considerably fewer Christians – 120. The difference in numbers of people killed is thought to be because the Christians wore protective armour while the Moors did not. It wasn’t long after that the Christians captured this region of Spain. Despite the harsh conditions and being at a relatively high altitude, the reserve has a large array of flora and fauna. Some of these are endemic to the Torcal mountain range. Interspaced among the karst formations are lush almost tropical-like valleys full of vegetation and brimming with life. Walking through is unforgettable. There are tunnels of vegetation in what feels and looks like a prehistoric setting. Children will especially love it – every way you look captivates and fires the senses! El Torcal is a floral paradise. Springtime is perhaps the best time to visit when it’s covered with beautiful wild flowers. Especially of note are the orchids – with more than 30 species. Wild rose bushes and various brambles create amazing vertical gardens across the rock faces. As you walk, keep your eyes upwards but not only for these vertical gardens. Here is home to various raptors, including griffon vultures and golden eagles, often circling high above the landscape to scan the horizons for their next meal. El Torcal also makes an ideal habitat for numerous reptiles. 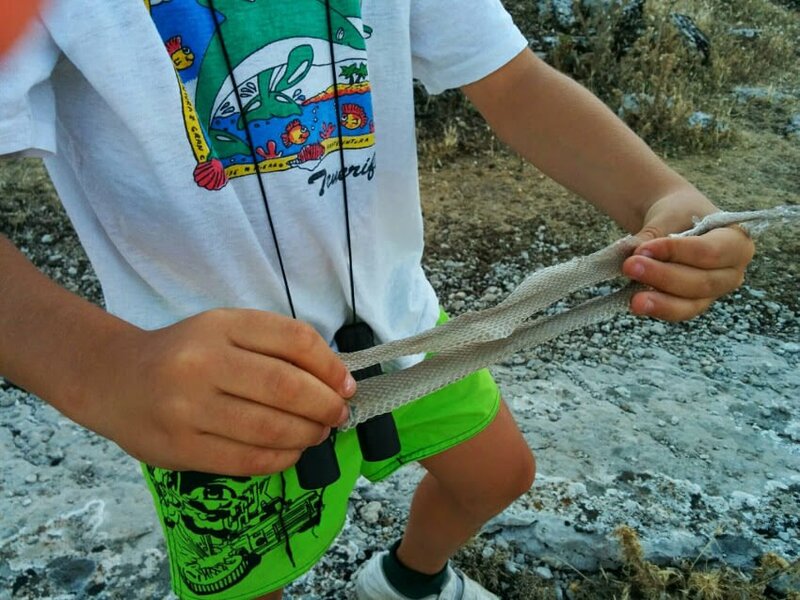 Two of these are native: the eyed lizard and the Montpellier snake – that can grow up to two metres in length! However, the largest and most visible creature is, without doubt, the Ibex, the wild Iberian mountain goats. They seem to be everywhere. Watching you from every peak. The Centro de Recepción, the visitors centre, is usually the starting point of any visit. It has a restaurant, an exhibition hall that displays fossils and has regular audiovisual presentations explaining the local geology, flora and fauna. There is also a shop that sells maps, books and souvenirs. The maps are useful if planning to explore the area – although the set routes are well signposted, it’s a good idea to pick one up. Many of the karst formations have been given names, that when translated include The Knight, The Thumb, The Camel, The Sphinx, The Castle and such according to their appearance. The Screw – El Tornillo – is actually a protected Natural Monument. Children will have a lot of fun spotting them! There are three set routes through the reserve. A green, yellow and red one. The pictures in this post are from a combination of all three routes. In order to protect the flora and fauna and because of the dangers involved, the red route (4.5km) is in a restricted zone and can only be visited with a guide. Information on guides is provided in the visitor’s centre. The green and yellow routes are open to all and can be walked without a guide. The green route is the easiest, 1.5km and it usually takes about 30 minutes. The yellow route mirrors the green and then divides off mid-way and passes through some spectacular parts of the park. Rocky labyrinths, that are filled with vegetation. The yellow route is 3km. Both routes are circular and finish back at the visitors centre and a viewing point called Mirador Las Ventanillas (The Windows Lookout). 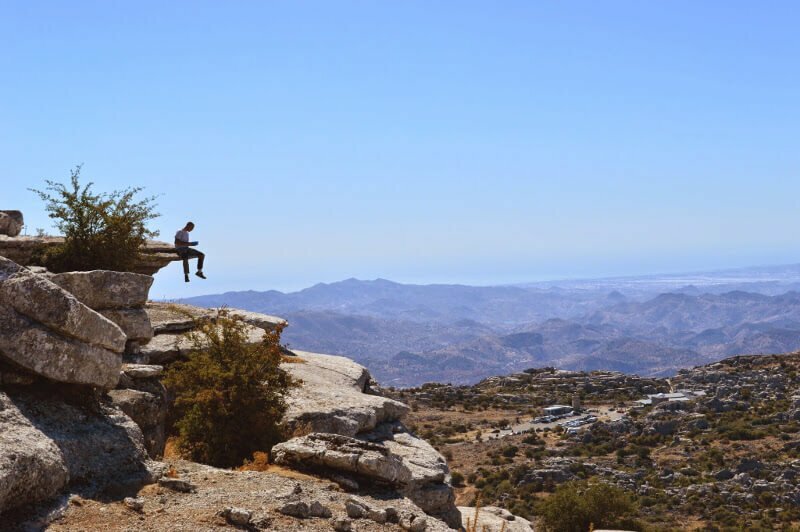 It’s a spot that offers the most fantastic views over the surrounding countryside and on a clear day back to the Costa del Sol and across to North Africa. By following one of the little paths that lead off from the Mirador Las Ventanillas, one spot to visit is in an area known as the Ammonites, where there are some fantastic fossils. A word of warning, do not deviate from the set paths. 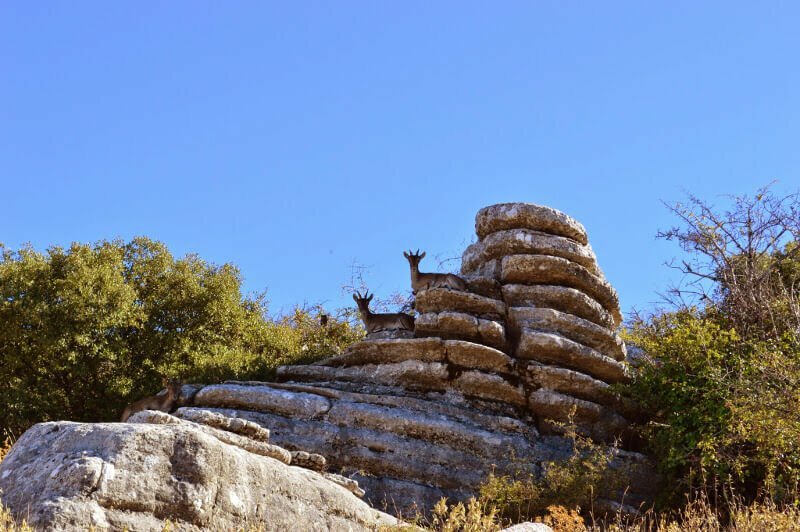 It is very easy to get lost and disorientated in El Torcal. It’s something that happens quite often and occasionally ends with tragic results. Under no circumstances enter the caves on your own accord either. The green and yellow routes are well marked. Stay on them. 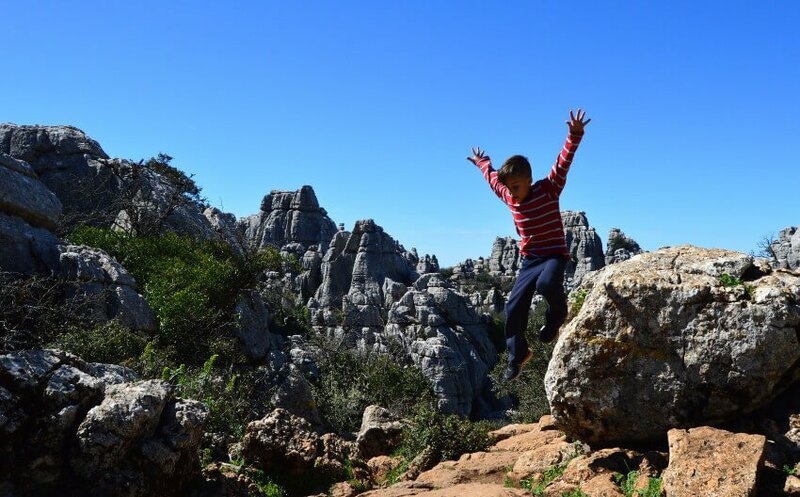 Temperatures can be extreme in winter and summer, so the best time to visit El Torcal is during the spring and autumn months. The Observatorio Astronómico del Torcal (Astronomical Observatory Torcal) sits adjacent to the visitors centre. It houses some very powerful telescopes, lasers and even specialised sun telescopes. Best of all, this advanced astrological centre is open to the public. It runs various courses and has regular “Window to the Universe” evenings. The lack of light pollution and the high altitude (1,200m) combine to give some unbeatable night skies. There are special astrological viewing nights. These events feature stars, planets, different universes and various moon phases. An unforgettable experience. During spring and summer, they often take place every couple of weeks on Saturday nights. You need to register first and it’s best to do so by sending an email to inscripciones@astrotorcal.es and leaving your mobile number. Prices vary but tend to be around €8 per adult and €6 for children/pensioners. The guided viewing sessions last about two hours. Daytime solar viewing takes place on Sunday afternoons. Check the website for further information. 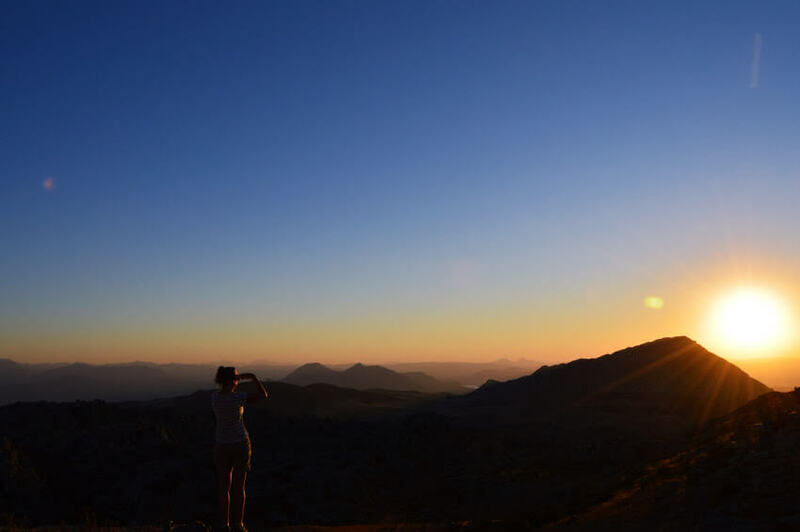 Weather conditions can change very quickly in El Torcal – they’ll give you a call beforehand and let you know if they do to save you a wasted trip. For more information see astrotorcal.es or call +34 600703700 (you need to speak Spanish). 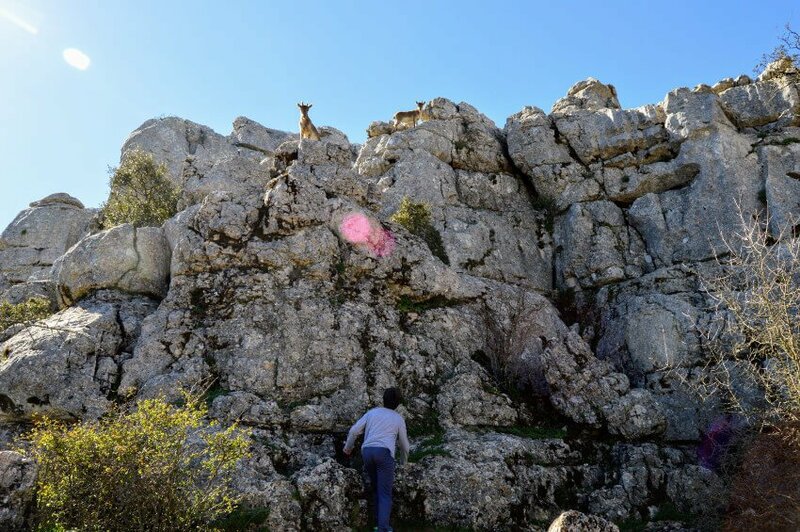 If coming from the Costa del Sol/Malaga direction, the best way to reach El Torcal is via Villanueva de la Concepción. You can drive into the centre of Antequera and work your way upwards on the MA-9016, which although a very scenic route takes longer. Tel. +34 952 24 33 24. This is updated and revised article that I originally wrote for Spain Holiday – found here.